While Hawaii offers many kinds of delectable jams and jellies, these jams are a kind of clothing. and with a shaka sign (friendly gesture in Hawaii). Jams are loose-fitting, knee length swim trunks. Often they are baggy and colorful - in an eye popping kind of way. They are popular with surfers and were invented in the 60s by David Rochlen, a former movie stunt man among other careers. He wanted something more comfortable to wear in the water like pajamas cut off at the knees. Those pajamas became jams. 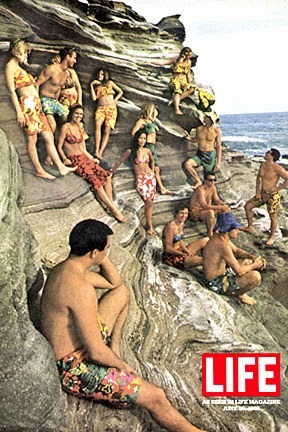 This Life magazine cover image popularized Jams. Growing up, I pretty much called any kind of oversize swim trunks Jams though I think board shorts tend to be more fitted, and/or shorter, especially for women. Jams are typically worn by guys, with a knee length and baggy cut. The creation of Jams in the 60s spawned a larger clothing company for David Rochlen that became Jams World, a resort wear line that is still going on strong. What’s cool about Jams World is that the clothing is made in Hawaii. I know this because I used to work there. Downstairs I would walk to the sewing area between rows of industrial machines and women, many of Filipino origin, flying their fingers through fabric, chattering in Ilocano and other Filipino dialects. The seamstresses were very talented, putting together amazing outfits for the year end Christmas party. I also had the pleasure to work with David Rochlen. He was a very talented, energetic man who could drink a lot of black “battery acid” coffee. I never had to make coffee for him, good thing, because I don’t know if I could have made it strong enough. He had a very shrewd gaze and would categorize fabrics as a “hokey Hawaiian print” or geometric or floral or “shibuye” which is really spelled as “shibui” a Japanese term for subtle. The most fascinating thing for me was the “library” which was a treasure trove of all kinds of items for inspiration, like a big attic of Grandma’s treasures and vintage Jams clothes. One could get lost there under giant dust bunnies and Mexican piñatas. It could be scary and exciting at the same time. We bought board shorts but my teen actually prefers the Jam's style. He is horrified when his grandpa wears the old style that are really short. I wonder if jams was what the first teens who wore their big, loose jeans low on their hips were trying to copy. Thank goodness that style seems to be going out of style. I've been enjoying your A to Z, Courtney. You think you'd ever turn your posts into a book? I remember the Jams craze from the mid-80s! We even had "beach bum day" in high school, where we'd all wear our Jams and put sunscreen on our noses and wear sunglasses! Aloha Stephanie, love the high school story. Mahalo for stopping by! I've never heard them called Jams before... learn something new everyday! Funny, because it sounds like food!